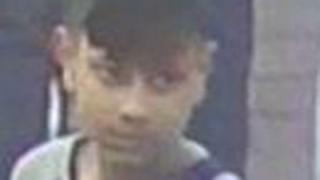 Two teenagers have been arrested by police investigating an assault on a 15-year-old boy in Bradford city centre. The 16-year-old boys were arrested on Friday and Saturday and released under investigation while inquiries continue, said West Yorkshire Police. Another boy, also 16, who was arrested earlier also remains under investigation. The City Park assault on 24 February left the victim with minor injuries. Police have issued an image of another male and asked for help in identifying him in relation to the investigation. Officers added the victim was of "Asian ethnicity", despite speculation on social media, and confirmed the assault "was not hate-motivated".